We often want html to display one way on one device and another way on a second device. In particular, we want a file to look one way on a big screen with a 1600px width, and a very different way on a small screen with 320px width. We can achieve this effect by linking in different CSS files depending on the size of the screen. Alternatively, we can simply apply different CSS styles from the same CSS file. Some people assume that the solution to this kind of problem is to write two different HTML files: one for Mobile, the other for desktops. It turns out that this is not necessary. 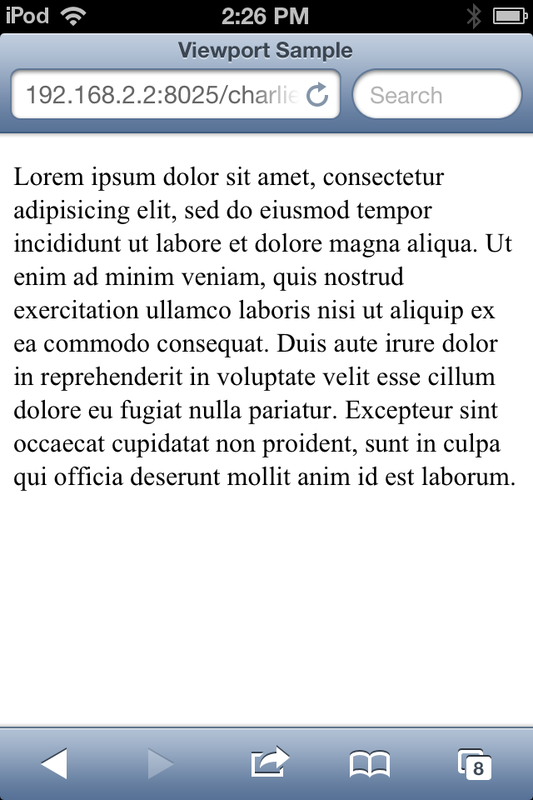 A technique called Response Design allows you to write a single page that looks good on both devices. On this page you will learn how to use one CSS file if the screen is less than 600px, and other if it is less 1024px but larger than 600, and another if it is larger than 1024, etc. You will also learn how to use one CSS file, but to apply different portions of that file depending on the resolution of the screen. You will, of course, also learn how to use media queries to determine the characteristics of a screen. Finally, or rather firstly, you will learn about a relatively arcane piece of Mobile called the viewport. Before we dig into media queries and CSS, let's start with a brief discussion of the viewport. As you will see, properly setting a viewport meta tag is an essential part of any HTML file that targets mobile devices. It will however, take longer to understand the viewport, and to see why we need this meta tag. While it is not crucial that you understand these things, it is useful information. The next two screen shots show a page displayed on an iPod before you put in the meta tag, and after you put in the meta tag. Figure 01: Before you put the meta tag into the source for an HTML file the text can sometimes be much too small. Figure 0X: The meta tag makes the print look right on a mobile device. Text is now the right size because we have added the viewport meta tag. Take a look at the two pictures. Clearly, if we are designing pages to be shown on a mobile device, the viewport meta tag shown above is useful. This tag also does the right thing on a desktop browser. In other words, there is usually no down side to putting in the tag. If you think your page will be shown on a mobile device, put it in. Note: If you are using jQuery Mobile, the tag is not necessary, as jQuery Mobile takes care of this king of thing for you. That is all I'm going to say about viewports for now. If you want to learn more about this subject, skip to the end of this page, where I attempt to tackle the subject in more depth. Here are some examples of the kinds of queries you can write. The words min or max in a media query means "less than or equal to" or "greater than or equal to." More details on Media Queries from W3.org: media queries. And here for CSS2, which are less powerful. Media Queries are case insensitive. If you compose queries in a comma separated list, then the comma acts like an OR operator: If one of the conditions is true, then query is true. media="only screen and (max-width: 2048px)"
media="only screen and (max-width: 1024px)"
should be green, else it should be red. Be careful if you want your query to work on a PC as well as on small devices. If you use max-device-width or min-device-width you are talking about the capability of the device itself, not about the current state of the browser. The device query might do what you want on your phone, but not on a PC, assuming you want different style sheets not just on different devices but when the browser changes width. The lte bit stands for less than or equal. Here are some explanations of the IE conditional operators. One good strategy is start by targeting a low end device, such as an underpowered phone. Then we layer increasingly powerful designs on top of that, building up to a desktop. Where I write redefine it, i mean that you should come up with a new set of properties for the article selector. Ethan Marcotte writes about this subject in his book Responsive Web Design. Before we get started talking about viewports, I should perhaps make it clear that there is little about viewports that is easy to understand. In short, the one thing we can be clear about is that little about viewports is easy to understand. You can think of the viewport as the rendering area for an HTML page. Typically, this means the width and height of the area in a browser where output can be displayed. On a desktop, this area changes as the user resizes their browser. On a mobile device the browser is rarely resized by the user, except when they switch between landscape and portrait mode. The viewport is typically the viewable area of the entire mobile device, though this is not always the case, as their are various toolbars, headers and footers that sometimes take up screen real estate, thereby permanently or temporarily shrinking the size of the viewport. It is true, however, that the rendering area for a page on a mobile device is usually both quite small, and relatively static. So far we have established the that viewport is not the same thing as the screen, and on a PC is often less than the total screen area. This is especially true on large screens of 1600 pixels or larger. In those cases, users don't always maximize the browser, but instead give it some arbitrary portion of the screen real estate. Confusingly, the viewport can sometimes be larger than the available screen real estate. For instance, if you are viewing a picture that is 1024x768 on a mobile device that is only 320px wide, then sometimes the picture is scaled so that parts of it will be off the screen. The same is true of a complex website with many columns and sections. Often, we see only a part of these pages. Those parts that are off the screen may still be part of the viewport, even though they are not visible. This larger viewport is sometimes called the layout viewport, while the visible portion of the page is called the screen viewportor device-width. Consider what happens when you go to a page like the non-mobile New York Times page. On a phone, you may zoom way out so that the whole page is visible, with very tiny print. In this situation the layout viewport and the screen viewport are identical. In other words, the width of the layout viewport and thedevice-width are identical. ****The advantage of this view is that you can see the whole page, and know where you want to zoom in. The disadvantage is that the text may be so small that you can't even read the headlines. When you start to zoom in on the New York Times front page, then the screen viewport changes the number of pixels it can render, but the layout viewport does not change. In general, however, it is simplest, particularly at first, to think of the viewport as the area of the screen or browser in which a page is being rendered. So why is all this information so important to us? As we have seen, a desktop browser may have a width of 1600 or more pixels. A mobile device, on the other hand, may be only 320px wide. These huge disparities mean that our strategies for rendering an HTML file will need to vary widely in these two different cases. Responsive Design is the mechanism we use for solving the this problem. Browsers tend to scale a page down to fit inside the available screen space. For instance, if we try to fit a page designed to for a 1600px screen into a 320px screen, we will end up with very tiny text. If you are trying to see all of page designed for 1600px screen on a mobile device, this scaled down view can be useful. You have to zoom in to be able to read the text, but at least the overview lets you see where to zoom in. If, however, you designed the page to fit on mobile device, then you don't want the text to shrink down so it can all fit on one page. In other words, you want the text to stay at normal size, and not shrink. You can use the meta-tag to tell the browser not to shrink the text just because it won't all fit on the current screen. This tag can help create pages where the text is not scaled down so that big pages fit onto tiny screens. If you have already designed your page to fit on a small screen, then you don't want it to be scaled down, and this tag does the job. Put it in the <head> element, of course. See also, meta tags. A key point to grasp here is that when we use this this tag withwidth=device-width, we are talking about the device itself, about the size of the entire physical screen. When we explore Media Queries below, we will be thinking about the current size of the viewport which can shift according to the way we resize the window for the browser. On a desktop PC the size of the browser is frequently not the same size as the device itself. Even a maximized window is not the same size. Frankly, these differences are, at least to me, confusing when I think about them too hard. It is simpler to just put the darn meta tag shown above in your code, and then move on; Media Queries are not nearly so hard to understand. 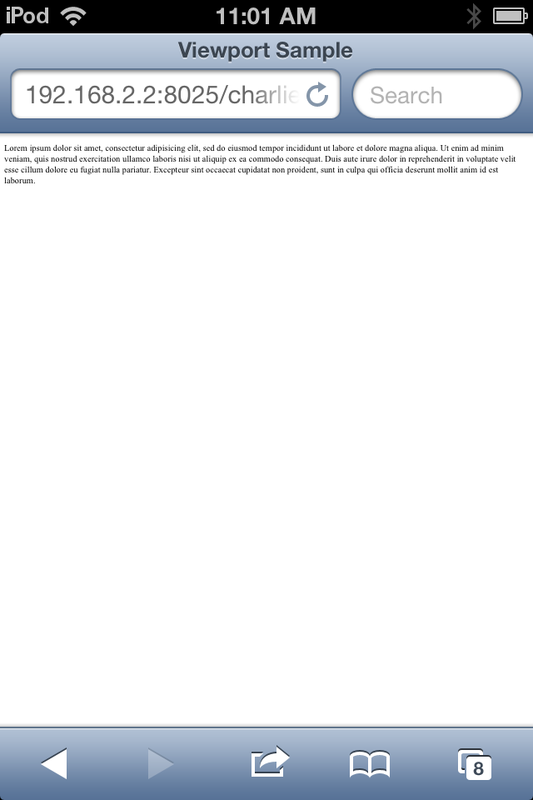 In this case we are setting the maximum-scale to one, which means that the user cannot zoom in on the page. Frankly, I don't see a big need to prevent the user from zooming, but it can be useful if you want to prevent the user from accidentally futzing with the available options. Respond.js is code to add Media Queries for IE6-8.